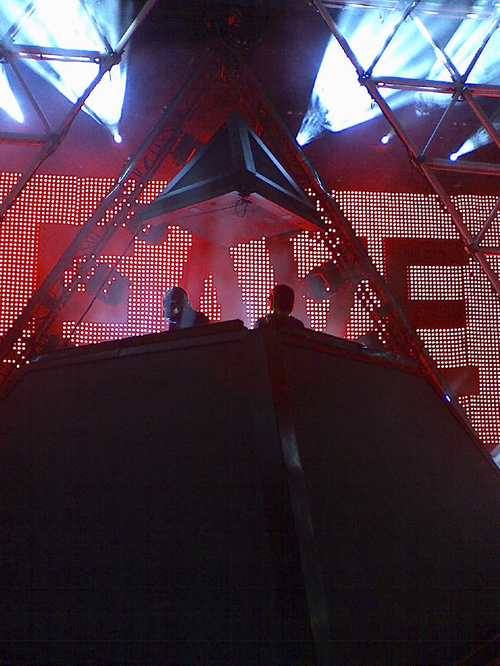 Continue reading "Daft Punk/The Rapture 7/31/2007 Red Rocks Morrison, CO"
This is the second time this season that Hot Hot Heat got to play Red Rocks, they opened for the Killers on May 17., the show that Brandon Flowers had to cancel after the second song due to issues with his voice. Hot Hot Heat stole the show that night and did a great job this night as well. 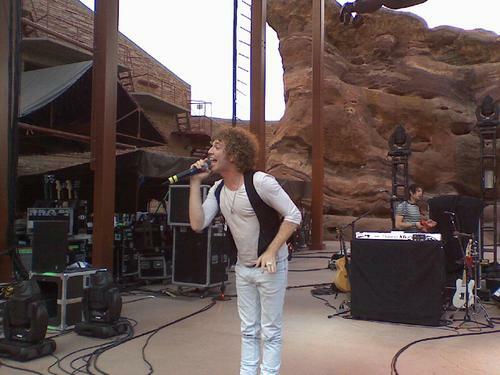 Singer Steve Bays is energetic and likes to play to the crowd. Their catchy pop sing alongs were a hit with the young crowd , and so was their energy. I was looking forward to seeing Snow Patrol, I saw them in March at a sold out show at the Fillmore and they sounded great. I was wondering how they would handle the leap from a 4000 seat venue to a 10,000 seat venue. It was great to see the amazement on their faces as they walked on stage.They opened with "Hands Open." Singer Gary Lightbody spoke to the crowd about how the band growing up in Ireland and Scotland saw the U2 Video "Under a Blood Red Sky"which was filmed in 1983 had inspired him and that it was a dream come true to play Red Rocks. You could see that he was truley inspired by the beauty of this magical place. The Highpoint of the show was when they payed " Chasing Cars" and "Shut Your Eyes". The fans sang along to every word . It was a great show and it was good to see the way this place energized the band. 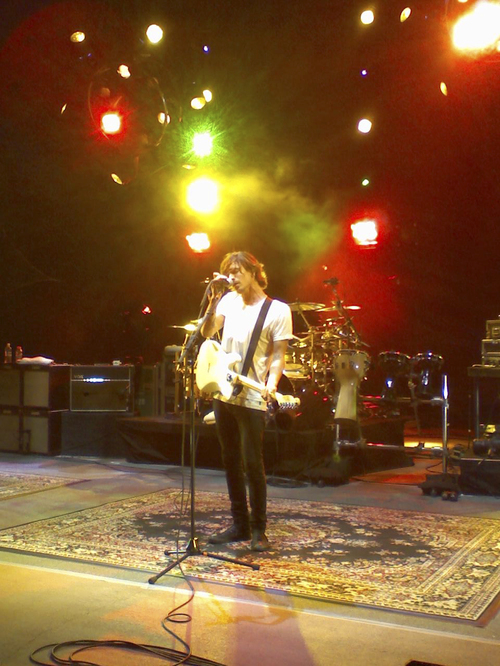 Continue reading "Snow Patrol/Hot Hot Heat July 30 , 2007 Red Rocks Morrison Colorado"
As I am racing to Red Rocks after leaving Ozzfest, I get a call asking if I will be there in time to take the Backstage photo with the band and concert promoter. I tell them I am on my way but might not get there in time. I arrive 10 minutes late and just miss the shot. No worries, Leftover Salmon is about to take the stage. Leftover Salmon has just reunited after taking a short break , they had been a mainstay on the local colorado music scene for years. When they walk on stage they get the loudest reception of any of the bands that have played Red Rocks all season (so far). Pretty impressive considering that the venue is not full yet. They play a mix of bluegrass, jam band and jazz or as they like to call it Poly Ethnic Cajun Slamgrass. They absoulutley own the stage and everyone's attention is on them. They comment on the beautiful sunset and make jokes as they play a mixture of songs and styles. Scramble Campbell a local painter , documents the show during the set and holds up his painting at the end of the set. Leftover Salmon makes me re-evaluate that fact that I am not a Bluegrass fan . I modify it so that live Bluegrass is cool, but listening to it on the radio/stero is not cool, it just doesn't have the same effect. 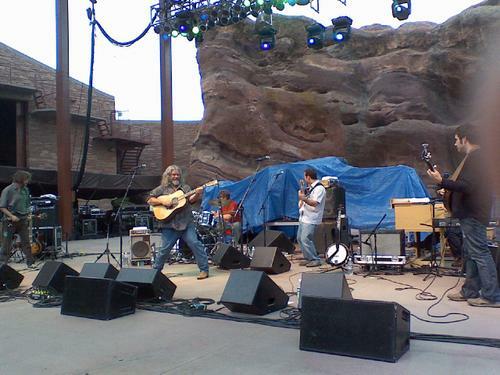 Continue reading "Moe/Leftover Salmon July 28 , 2007 Red Rocks Morrison Colorado"
As I walk up to the venue, I smell cheap marajuana and notice a Shotgun Willy's Convetable Car advertising for the Local Strip Joint. The parking lot is filled with kids in black concert shirts and scalpers. This takes me back years; my first concert was Motley Crue opening for Ozzy when I was in 6th Grade. I am excited to photograph Ozzy, it's like coming full circle. Getting to photograph the first band you ever saw in concert. I pick up my photo pass and am told that no one gets to photograph Ozzy, which is a total buzzkill. 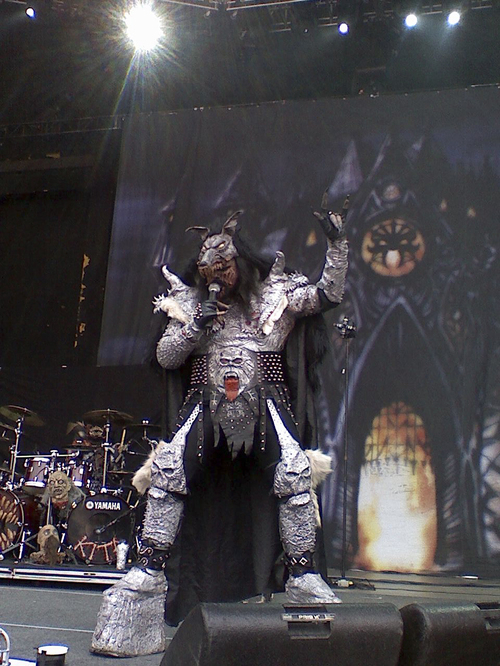 Okay, I was hired to photograph the band Lordi and that's what I am going to do , I have heard some cool things about them. They are kinda like the European version of GWAR, so they should be pretty cool. First thing I head to the 2nd stage which is sponsered by Jagermeister this year, the only band on the second stage who's name I recognize is Hatebreed. I had photographed them at the Ogden Theatre opening for someone over the years. Continue reading "Ozzfest July 28, 2007 Coors Ampitheater Englewood Colorado"
Last night Bob Weir and Rat dog performed at Red Rocks. 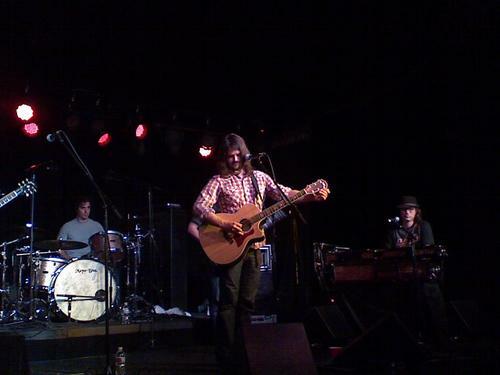 Keller Willams opened the show; his mix of loops, harmonies and overdubs have a great sound. He gets better each time I see him. Bob Weir joined him for a couple of songs at the end of his set. Deadheads flocked from the near by mountain towns to catch a "Bobby" play classic dead tunes. Rat Dog sounded the best they had in years. They opened with Shakedown Street. My heart was elsewhere, so I decided to leave early. I just wasn't up for the 3 hour set that Rat Dog was planning to play. It was a beautiful night at Red Rocks, but I just wasn't up for it last night I guess I didn't have the right dance partner. 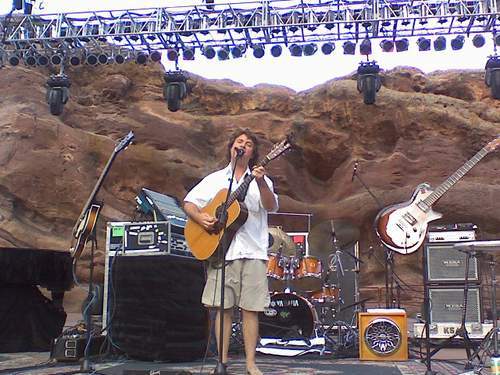 Continue reading "Bob Weir & Ratdog/Keller Williams 7/24/07 Red Rocks Morrison CO"
As I am driving to Denver for a pre-party for the Global Dance Party in Denver, I pass a bank. The tempurature on the clock reads 100 Degrees. I think to myself, "What the F am I doing? I should be in the Mountains camping with the most beautiful girl in the world." But such is the life of a Rock and Roll photographer. I have a couple gigs to cover tonight, first the pre-party, then the Global Dance event and then Cary Brothers at the Soiled Dove. I arrive at the rooftop party, and DJ Backwards K offers me a beer and some food from the grill. He is manning the turntables and hosting the party, doing both flawlessly. 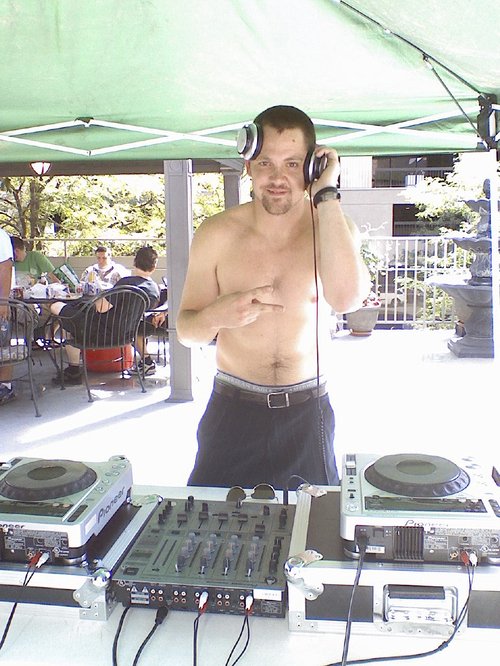 Continue reading "Global Dance Pre-Party 7.21.07 Denver"
Last Night after leaving Red Rocks I raced down 6th Ave to the Soiled Dove Underground to catch a performance by Cary Brothers. You may not know his name yet but you will soon. You probably have heard his music without even knowing it. He has a song on the Garden State soundtrack and has appeared on a numerous television shows. I met Cary a couple of years ago in Vail for the Vail Film Festival where he performs every year. His music is heartfelt and the lyrics and beautiful but not sappy. It was great to see him playing with a full band as well as his solo acoustic stuff. He was in a great mood as he joked with the audience. There were two girls that decided to hula hoop during one of his songs. He thanked them afterwards, played requests from the crowd, and came down after his set to meet his fans and sign autographs. In the next couple of years his fanbase is going to skyrocket as his music gets more widely known. 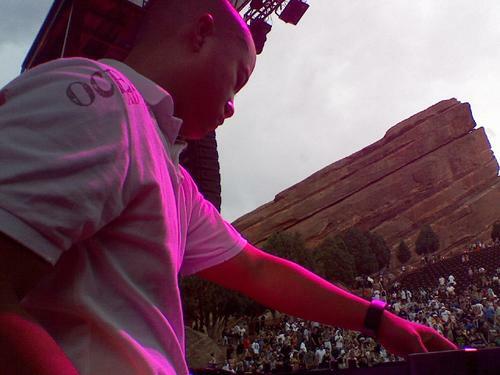 Continue reading "Cary Brothers 7/21/07 Soiled Dove Underground; Denver"
Every year on the 3rd Saturday in July, Red Rocks Ampitheater turns into a giant outdoor dance club. Last night was no different, with glow sticks and kids dressed in rainbow colors grooving to the likes of Tiesto, Jes, BT, Richard Vission, Kostas, Dragon vs Trajikk and Aphrodite. The sold-out crowd was way looser than the show a couple of nights ago for Bob Dylan. I felt that BT, Kostas, Jes and Dragon vs Trajikk stole the show as well as the go-go dancers and performers. I didn't think Tiesto lived up to the hype. His set got better as it went on, but it moved very slowly, and took too long to get things bumping. The crowd seemed to enjoy it and I guess that's all that really matters. But I think if you are going to have so much hype attached to your name you need to bring it! It was a beautiful night and, don't get me wrong, a night of music at Red Rocks sure beats the hell out of being any place else. I look forward to next year's event and seeing how it compares. Continue reading "Global Dance Party 7/21/07 Red Rocks Morrison CO"
Incubus returned to Red Rocks for the first time since recording their DVD "Alive at Red Rocks". This was the Band's second time playing the venue and they seemed even more in awe of it this time than the first time. I spoke briefly with the band backstage before the show and all the members we excited about returning. Opening the show was a band called Simon Dawes, they got a luke warm reception from the sold-out crowd, which was excited about seeing Incubus. When the band hit the stage, the crowd exploded with a thunderous roar. Some of the hits they played included: Drive, Dig, Anna Molly, Wish You Were Here, The Warmth, Oil and Water, Vitamin, and Kiss To Send Us Off. They closed the show with Aqueous Transmissions. The hour and a half set came to a close sooner than expected, they easily could have played and extra half hour to an hour. Brandon Boyd thanked the crowd and expressed how beautiful it was to play such a magical place, something many performers forget to notice when playing Red Rocks. For that he gets much respect in my eyes. 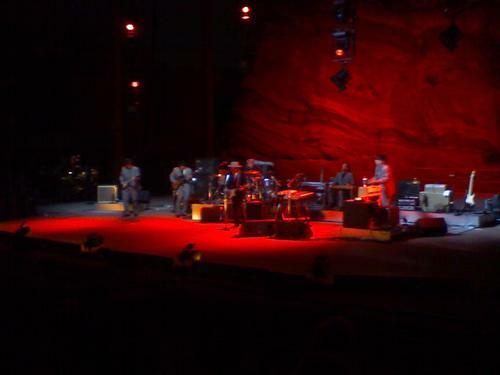 Continue reading "Incubus 7/18/07 Red Rocks; Morrison, CO"
Bob Dylan , returned to Red Rocks last night for the first time in 20 years for a 2 night run at the world famous venue. Opening for Dylan was My Morning Jacket , who in my opinion stole the show. MMJ brought a mix of vital energy , and fierce guitar. It was great to see Dylan playing at Red Rocks , but at the same time. I left feeling disappointed. I think he has written some great songs and helped change a generation. However , I feel he is the "Ozzy" of my parents generation. He was once vital and and even a sopkesman for his generation , now he is a munbleing, bumbleing over the hill grumpy old man , hardly a rockstar , who should have gone out while still at the top of his game. He seems almost hostile to his fans and you can almost feel that he doesn't want to be there. Which begs the question WHY? Sure I am bitter becuase he doesn't allow photographs , but I would be much more so if I still thought he brought the energy he once had.